How many of you have seen this photo filtering through the online world? Teaching is so much more than babysitting. (Although unfortunately, nowadays there is a whole lot of babysitting being done due to overcrowded classrooms, testing, unavailable resources, etc.) Real teaching and real learning involve getting students to think at a higher level- not to be able to read and do sums but to really understand the why and the how. 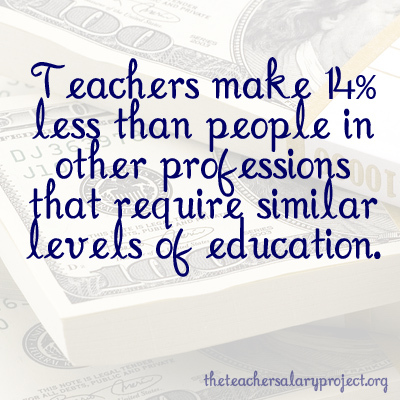 To get students to this level is highly taxing on our minds. Teaching is so much more than teaching. It is not only being a teacher but being a counselor, a mediator, a parent, a friend, a social worker, a role model. We are being watched 24/7... even when we go grocery shopping, run errands, go home. I happen to live in a neighborhood districted to go to the school I work at. Students live as close as next door to me. I am always being watched as a role model. There is no "off time". As the film said, teachers need to fill all these roles before the actual learning can occur. For real learning to occur, all issues must be resolved or put aside. And let's just quell the myth that teachers work 6-7 hour workdays and have summers and breaks off. 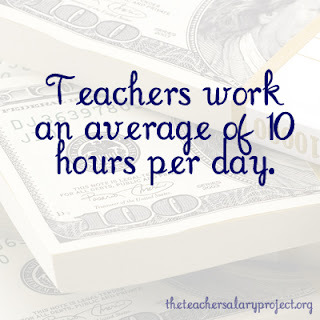 Real teachers work 24/7. Take my typical school day. I leave for school at 6:55 and get to school at 7. (Yes, I know, I have a wonderful commute. But imagine if a teacher lived further from school. Imagine how much longer their work day would be.) We are required to be at school at 7:15 but I need those extra 15 minutes to help students who come early and to prepare for my first period. From the moment I get to school until 7:40 when I have to be at my door greeting students, the work is nonstop. I am checking for important emails, helping students with projects, eating breakfast, organizing my desk and sometimes even grading. I have Ceramics first period so sometimes I have to prep clay for a demonstration. We have block scheduling so we have four periods a day that are each ninety somewhat minutes. Now I know that my friends think I don't do anything because I am always on email but nowadays we are required to be on top of emails. That is how we receive important announcements such as "You will be having a fire drill at 1:05 today." If I don't keep checking my computer, I will miss those important email announcements. Throughout each period, I am not just watching the students make wonderful artsy creations. (I wish.) Most of my students don't want to be in my class; they are just in it for a graduation requirement. Or they think it's an easy class. This means I get all sorts of kids. I get 9-12 all in one class. I get all the ESOL students. I get all the IEPs and 504s. (How much preferential seating can you have when practically everyone legally requires preferential seating?) I keep students on task, I try to inspire them when they say they have no ideas, I mediate conflict, I am on the lookout for signs of homelessness, neglect, physical abuse and drug abuse. I talk to the kids and try to create meaningful relationships. I try to teach them how to follow directions, how to write in complete sentences, to capitalize "I" when you are talking about yourself. I try to get them to think creatively and to problem solve. I try to be available whenever they need assistance. And I try to teach in between all of that stuff. I have second period planning. 15-20 minutes of that are taken up by Neighborhood Watch (aka hall duty). (I like to refer to our Neighborhood as the red light district... but that's another story.) My planning is usually spent running around the building, depositing funds (I'm always fundraising for something) or delivering papers to mailboxes. The rest of my planning is cleaning up clay from first period and setting up the materials for third and fourth period. And some grading in there. And answering emails that I didn't have time for yet. Oh yes! And go to the bathroom. It's not like you can just leave your class in the middle of the period to relieve yourself. Rarely do I get the time to just surf the web or read a book or chat with people during my planning. Occasionally it does happen and that's a treat. :) In other jobs when you get a break, you can do whatever you want... not continue working! After fourth period I never just leave. Fourth period ends at 2:25 but teachers aren't allowed to leave until 2:45. Mondays I stay after school to sponsor Bible Study until 4. Tuesdays I stay after school to sponsor National Art Honor Society until 4. The first and third Wednesdays of each month we have staff and department meetings, usually until 4. The fourth Wednesday is now dedicated to meetings regarding our February play of Willy Wonka. Thursdays and Fridays I try to leave by 3 or 3:30 but I know teachers that stay late even those days too. And we aren't even mentioning parent-teacher-guidance conferences. Our school usually holds those after school too. Good teachers foster relationships with their students by supporting them at their games. Or chaperoning their dances. Or showing up at plays, musicals, events. Those eat into our evenings and weekends as well. What job doesn't provide essential office supplies? 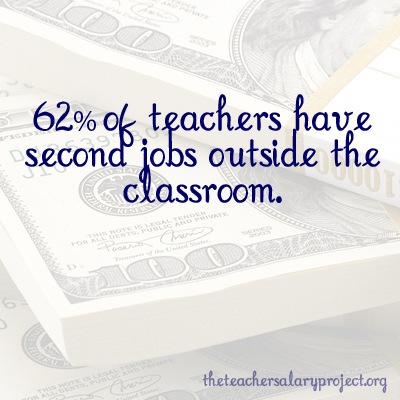 From the small salary that teachers get paid, a good chunk of it usually get's spent on essential classroom supplies. For the first several weeks of school, our school did not have a working copier that was available to teachers. Sure, the office copier worked but teachers were not permitted to use it. I know of teachers who spent hundreds out of their own pocket to get handouts and readings copied at a store. And I can't forget to mention that I haven't had printer access at my school since my first year teaching! (It's now my fourth.) Anything that needs to be printed, needs to be done on my personal printer at home. I am spending personal money on expensive ink each time I need something to be printed. Imagine that you were to go in to a doctor's office and ask for a receipt and the receptionist responds that you would need to come back tomorrow because s/he needed to print it out at home. Ridiculous, right? I learned a lot about the history of education and teachers in the film. 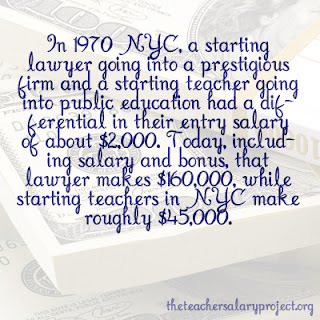 Did you know that "back then" a lot of teachers were highly educated? Women were only able to choose from a few professions such as nursing and teaching. Highly intelligent and qualified women were becoming wonderful teachers, resulting in highly intelligent and qualified students. Once more and more jobs opened up to women, they left the profession to become doctors and lawyers and scientists. Because they paid more. And were respected professions. And where does that leave our students? 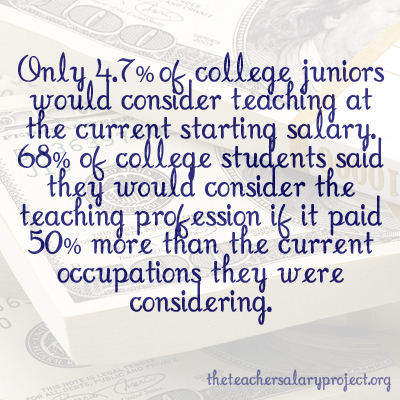 What incoming college student would want to become a teacher when they could get paid twice as much and do half as much work as a teacher? The film followed four teachers through maybe a few months of their life. I am so thankful for what we have, even though I am the only source of income right now in our household. One of the teachers has to work every evening and weekend to have enough money to make a mortgage payment! Several of the teachers had to quit teaching because they couldn't make it on a teacher's salary. 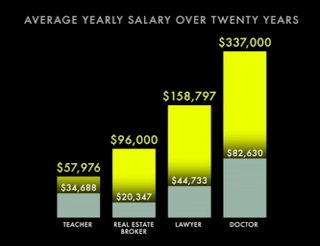 These people and these stats have made me very thankful that Todd and I are able to afford our very small home. These people and these stats have also made me very thankful that I haven't had to work a second job yet. But then again, we don't have children yet. The film kept proposing the idea that teachers be paid according to student performance. 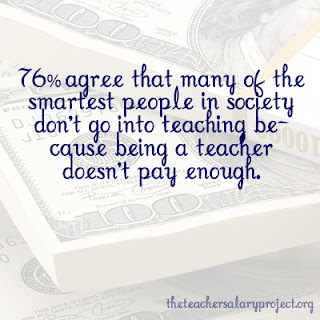 The stance they had was that theoretically good teachers would yield good students. My question is, what if you do all you can and still your students don't care? In the end, it's their choice to do the work, not yours. Not sure exactly how I feel about that one but that's another issue to debate. They showed the top three countries with the best education systems and students, Finland, Singapore and S. Korea. Then they compared them to our country. Take a look. These three countries have selective recruiting. Top students are picked from the top universities and colleges to become teachers. It's a high honor to be selected. These selected recruits are then given training they don't have to pay for. Unlike the US, where college students go into debt to get trained and certified to be a teacher before they get their low paying teaching job. These other countries also offer very competitive salaries. The US on the other hand, offers 14% less (salary-wise) than other professions. Finland, Singapore and S. Korea are all very professional working environments. They never have to spend money out of their own pocket for essential supplies. Teaching is looked at as a very important job and everything is provided. 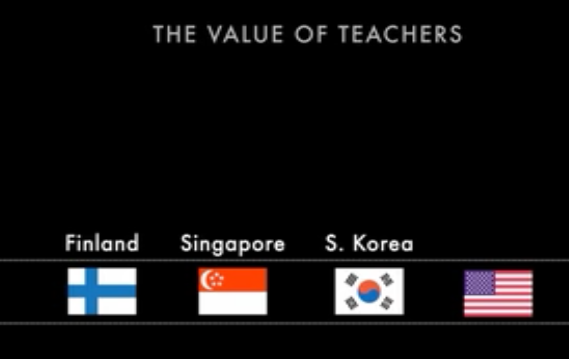 Lastly, these countries have immense respect for their teachers. In Finland, being a teacher is a coveted, highly looked upon career, much less a job. In the US, the burn out rate is so high, that it's more considered a job than a career. I am sure you have also seen this image floating around the internet. Here is an image of classroom respect in our country. Sad but true. The state of our education system and profession of teaching is failing. Will something be done? Will something be done soon for the future generations that will eventually be leading this country? So true! And not just in America, it's the same in Ireland. I'm sick of defending my profession. The other interesting thing when comparing how different countries value education is how much families will invest in their children, particularly in Asia. 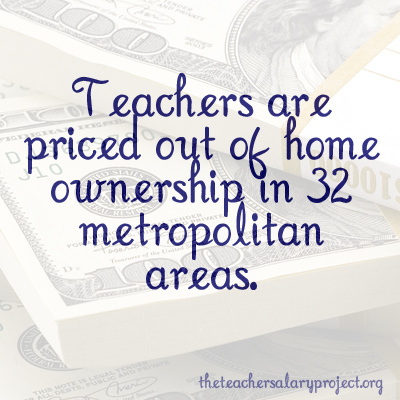 Often families pay a higher percentage of their income on their child's education than on their mortgage payments. Here people expect their child to be educated for free to a very high standard and the teacher to be paid as little as possible to do this, with zero investment in resources or facilities. Then they moan when we're not at the top of the OECD tables or little Johnny fails an exam! Sure its all the teachers' fault anyway, right?! 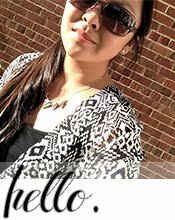 Great piece Lindsey and now that I am back in the classroom, I totally agree with all that you are writing about...it's so true!